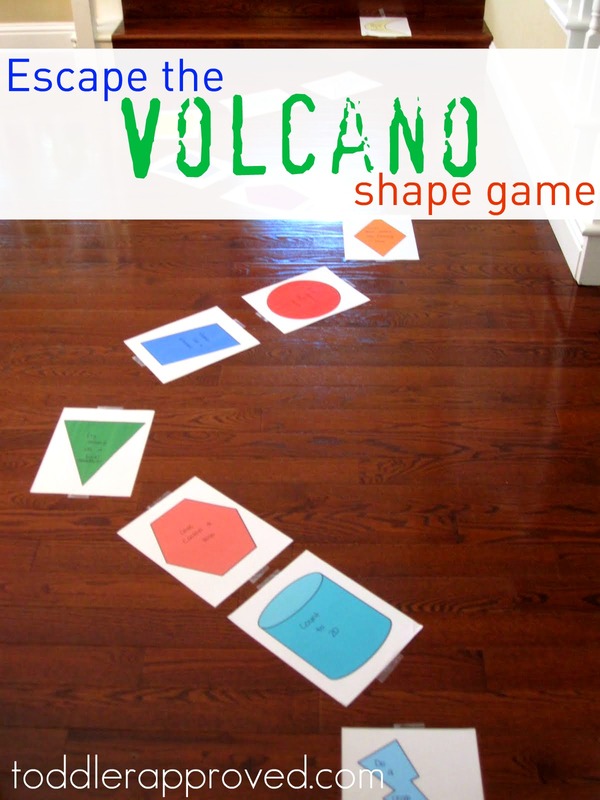 Our culminating activity for our dinosaur/volcano week was a morning playing Escape the Volcano! Skills our silly game focused on included: color recognition, shape names, counting, singing, gross motor skills, using a full sentence, answering simple questions, and following directions. 1. Print out your dice template and put it together. I liked this one because it helped the game go a bit slower so that we mostly landed on every square. 2. Print out your game board pieces and tape them to the floor. We printed off two sets and made them go everywhere! and your house at the end... when you reach the house, you've survived and escaped the volcano!! 4. Brainstorm what you want each game board piece to say. We printed out one version of game board pieces that had pre-printed activities on them and another one that was blank... so my little guy could help me decide what we were going to do. Some of the activities we came up with were: slither around like a snake, fly around the room like a pterodactyl, skip in a circle, count to 20, kiss Caitlin (baby), crab walk around the room, stomp around like a dinosaur, sing Two Little Blackbirds, etc. 5. Start playing! The first player rolls the dice and then moves that many spaces. Once he gets to his spot, he reads what the game board piece says and does the action. We had so much fun moving our crazy game pieces across the board... and yelling as we were trying to escape. My little guy kept getting worried that the lava was going to get us! As we landed on each piece, we talked about the name of each shape, counted the sides (when necessary), and said the color of the shape. You could also talk about objects in your house that are the same shape. Wow! We were exhausted when we were done playing. If you double the game board pieces, you may want to print out your own blank die and put numbers 1-4 on it instead of just 1-2... otherwise it might take too long. I tried to avoid the dice templates that had numbers 1-6 because they just made the game go too quickly and you ended up skipping too many of the shapes. After we played the game each time, we walked along the game board pieces and as we stepped on each shape, we said it's name. Some were trickier than others- especially hexagon, pentagon, and octagon! We also included some game board pieces that asked the players to tell something about themselves (favorite song, food, etc.). When we landed on these spots we worked on using full sentences to share about ourselves. Making a whole game board of "get to know you" questions would be perfect to do with new friends. By the end of the game, everyone would know a little bit more about each other! I loved seeing my little guy's face light up when he got to share something about himself. We worked on not interrupting when I was sharing about myself and he wanted to tell something too. We talked about taking turns in conversation and then how to make appropriate follow up comments or questions when someone shares. Thanks for joining us for some dinosaur and volcano fun this week at Camp Mom! Next week we'll be moving and grooving with planes, trains, automobiles, and all sorts of other vehicles! That looks like an absolute blast. I am going to have to put this on my pintrest to keep this in mind! what a fun game - love the actions (donkey kicks, slither)! This would be great to incorporate into so many themes and model the actions to fit it - loving the idea. Thanks for sharing. My 4 yr old is obsessed with dinosaurs and he would LOVE this! I'm so happy to have found your blog through Sunday Showcase and am now following. Can't wait to read more. I think both my kids could do this at 3 and 4! Great idea!!! How creative! Found this on Pinterest. For an older child you could use a regular 1-6 dice and divide the total, ex.. 6/3 = 2. What a great idea! I'm definitely going to try this with my daughter and maybe some of her friends. Love this idea! I'm trying to figure out how to print it though; the link isn't printing correctly for me. Any advice? This is a great idea! THanks for sharing so we can all enjoy! Fabulous! As a special needs mom I see so much potential with this game! Thanks for sharing it with us. Hi, Im having trouble printing it too. i love this idea!!! Is it possible to email me the pdf files too. kyles0206@hotmail.com thanks so much. If you save it as a PDF it will print. There is a download tab at the bottom of the page. I have some dice I think would work great for this activity! It has pockets on all sides, so you can change them as you need it. Thanks for the idea! We'll be doing it soon! Thank you so much, it's a long cold winter in NY and I am printing this now to play with my preschooler! I have had several people try it and be able to print it out. Some it doesn't work for, so just email me. Is it please possible to have this great idea also in a pdf version? I can't print it either. Thank you in advance! Unfortunately I can also not print it. Can I please have the pdf version? This seems like an excellent idea. Definitely going to adapt this for my classroom -- I'm sure my kids will love it. Thanks for the idea! another idea, hide old easter eggs, no candy , just write little notes , so when they find the eggs they get to make the other player do silly things, like bark like a dog, put a slice of cheese on your mouth and try and eat it, go put a bed sheet over your head and go scare your mom, silly stuff like that. Thanks again for all these wonderful ideas! I love this but it's not printing for me. Any ideas?